If there is any city in Gujarat which can give a tough competition to other megacities of India in terms of growth, development, cleanliness and industrialisation, then it is certainly Surat. As it is generally popular as a major centre for diamond cutting and polishing, it is known as the diamond city of India. It has also gained immense popularity as the textile hub of India. Located on the banks of Tapti river, Surat has an age-old history and boasts of its rich culture. As per records, this fast-growing city was founded by a Brahmin in the early Medieval Period of India. However, in the subsequent centuries, it remained under the control of the Muslim rulers until it became a precious possession of the Portuguese Empire. Therefore, you can find several historical sites and ancient monuments within its boundaries. Today, Surat is more of an industrial city. However, it is also developing as a tourism centre on account of the presence of several ancient monuments and beautiful beaches. But how about going offbeat this time and exploring the hidden beauties of Surat? If Yes, then read on! If you have ever been to Surat, then you must have visited Mughalsarai and the European Tombs. But did you ever try exploring the beauty of the ruined and abandoned Surat Castle? If not, then let us tell you that you are missing out on something very important. Built in the 16th century by a Muslim king on the banks of the Tapti river, Surat Castle is one of the oldest structures in the city. Even though it is lying in ruins and its collapsed structure can only be witnessed, it still deserves to be explored due to its historical significance. This is one place where you might explore in detail about the Muzaffarid dynasty which ruled Surat for several centuries. If you are an ardent history lover, you shouldn't forget visiting this ancient masterpiece. Surat is also one of the few cities in Gujarat which boasts of their lively and beautiful markets. Therefore, it becomes mandatory for every traveller to explore its local markets once on their trip to Surat. From beautiful clothes to lovely handicrafts, you can buy hundreds of different items. 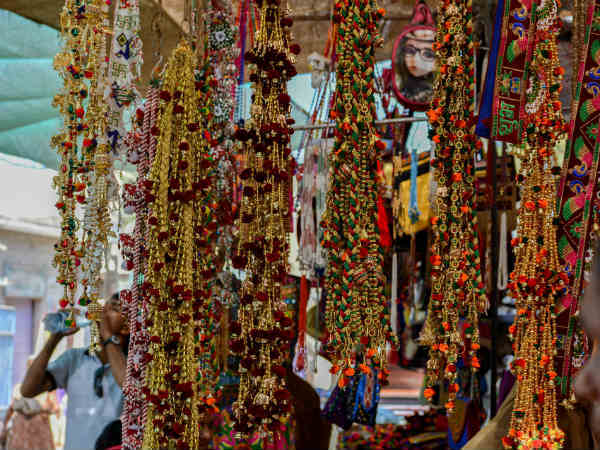 These markets are perfect for souvenir shopping in Surat. The list includes Shanivari Market, Dumas Road, Sahara Darwaja and Baroda Prestige. So, all shopaholics out there, what do you think about a visit to Surat this weekend? Most Read: Do You Know About These Mysterious Places In Gujarat? If you have ever been a history lover and are well acquainted with Indian history, then you must have read about the popular Dandi March, otherwise known as Salt March. It was one of the acts of civil disobedience which was led by Mahatma Gandhi in order to protest against the imposition of tax on salt. The protest happened in the form of a march which started at Sabarmati and ended at Dandi. So, if you would love to relive the period of Indian independence struggle, then you should not miss visiting the beautiful village of Dandi. It is located on the coast of the Arabian Sea at a distance of about 30 km from the centre of Surat. Gavier Lake is a beautiful place in the vicinity of Surat airport and has become a picnic spot for locals over a period of time. However, it is also visited by hundreds of bird lovers as it is one place in Surat where you can witness some of the beautiful species of migratory as well as indigenous birds. Do not forget to bring your camera if you would love to frame these colourful birds. Also known as Shri Shri Radha Damodar Temple, ISKCON Temple is one of the most beautiful temples in Surat. The temple is dedicated to Lord Krishna and is one of the highly revered sites in the city. Every year, it is frequented by tourists and Hindu devotees in thousands. The presence of a peaceful environment helps visitors soothe their soul. Hence, you shouldn't forget to visit the ISKCON Temple in Surat.